The Patay Single Diaphragm Hand Operated Pump is an optional hand operated diesel pump kit available on our Poly Cube range of UN Approved, mobile diesel tanks. It comes with 4.5 metres (15 feet) of diesel delivery hose and a manual diesel nozzle. 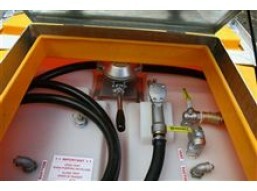 It can pump diesel fuel at rates of up to 45 litres per minute.